What are zip and links beds? At bed factory contracts we get a lot of enquires about zip and link beds, we suggest zip and link to many customers as it helps provide a solution the maximising the space and flexibility of their rooms. Zip and link beds are essentially (and normally) 2 single sized beds put together using a metal bar and a mattress zipped together. This means that you can provide a comfortable double sized bed for customers but also two separate single beds when required. 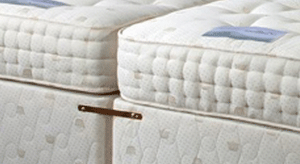 Everyone has different requirements when it comes to mattress comfort, and a lot of partners have different ideas on what they find comfortable, the zip and link solution means two singles can be manufactured with different comfort levels which can then be zipped together offering the best solution for both partners. As well as the ability to suit more of your customers comfort requirements, a double room can also be a room with two singles this gives you the flexibility of being able to offer guests exactly what they require. Another great reason for choosing zip and link is that turning the mattress becomes a lot easier because each mattress can be unzipped and turned / rotated independently, as double and king size mattresses can prove heavy to turn without a few people to help out. Often times when hotels and guest houses order beds, they sometimes struggle with carrying and moving the beds from room to room, this is another reason why zip and link is popular, it makes the transport of large divans and mattresses easier because they can be turned into two single beds for transport, so if you have awkward stairways or restricted access this makes life a lot easier. When purchasing a new bed with zip and link capabilities make sure two single headboards work well when joined together as well as when they separated on single beds. The majority of people tend to go for a super king zip and link, a super king bed is 6’0” in width meaning when they are separated into two singles they make the standard 3’0” single bed size. If you split a king size bed into two you get two 2’5” wide single beds, which can prove to be small for many people.